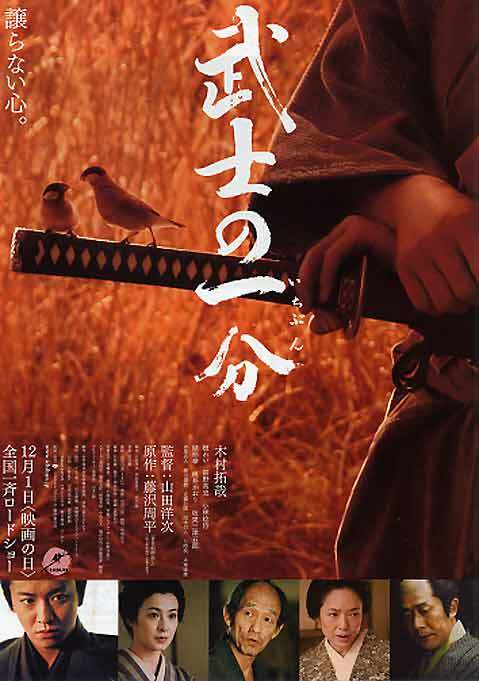 Shinnojo Mimura (Takuya Kimura) is a low ranking samurai. His job is to sample the food prepared for his clan’s feudal Lord. Shinnojo is married and looks forwards to the day he can start his own kendo dojo. His life suddenly turns upside down when he gets ill from tasting a dish prepared for his Lord. Although the dish wasn’t poisoned intentionally, the Red Tsubugai shellfish was cooked out of season and turned toxic. A few days later Shinnojo recovers but his eyesight does not. The young samurai is now blind. His wife, Kayo (Rei Dan), must now try to take to care of Shinnojo’s psyche, as well as to make sure they are financially stable. She is pressured by his family to ask for the favor of a high ranking official who has shown interest for her in the past. When Kayo visits Shimada Toya, Shimada agrees to ask the feudal lord’s help but in return Kayo must become his lover. Although Shinnojo’s spirit begins to heal, he feels that something is amiss with his wife. His aunt then tells him about a rumor concerning his wife and an unknown Samurai. Eventually Shinnojo has his male servent follow Kayo around town. The truth comes out about the illicit relationship between Kayo and the higher ranking Samurai. Shinnojo then learns from other Samurais that Shimada Toya (Mitsugoro Bando) did nothing to help him gain favor from the clan’s Lord. Now a blind man but still a Samurai in spirit, Shinnojo challenges the expert swordsmen to a duel to the death for love and honor. Oscar Lei Apr 08 2013 8:03 pm This is the most charming Japanese movie I have ever seen. Kayo, as portrayed by the beautiful Rei Dan, is a model of perfect love and devotion.